Traditionally, a wolf is an untamed creature, symbolizing intuition, loyalty and cunning, whose sly movements resemble that of a shadow. Painting such an animal in precise detail can seem overwhelmingly difficult, but these simple steps show you how just about anybody, experienced or not, can accurately draw and paint this wonderful creature from scratch. 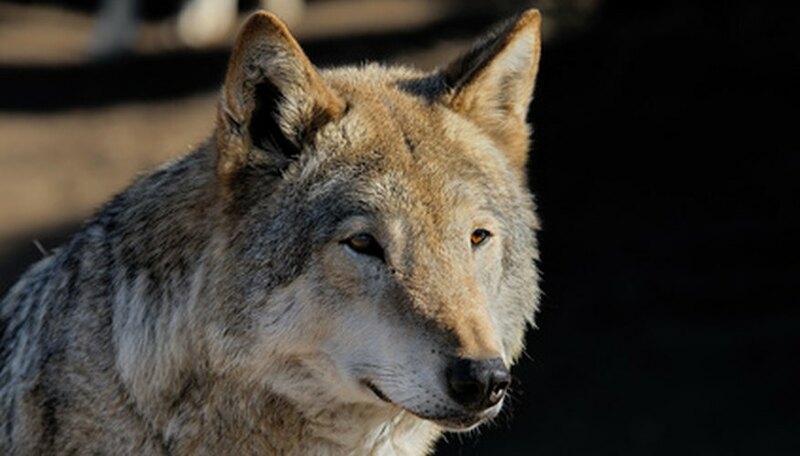 Find a clear image or photo of a wolf that you would like to draw that shows detailed texture, tone and color; it is virtually impossible to draw an image realistically without a visual reference, especially if you are a beginner. Draw a basic outline of the wolf onto a canvas, filling the page, using a 2B pencil. Create an accurate outline; don’t be afraid of making mistakes because it is easier to fix the mistakes now with an eraser than with paint later. Painting the background first, making sure to use muted colors and textures so that the visual emphasis will be on the wolf: A few dark varieties of a shade will often do the job well enough and should nicely frame the wolf into intended main focus. Mix colored paint generously with white paint to create the palest shades of the wolf and begin to gently brush in the lightest tones to your outline of the wolf. Keep these layers thin; you can always add to them later but it is very difficult to take them away. Reduce the paleness of your paint by adding color and paint the mid-tones of the wolf. Look for clumps of fur as well as color patterns; fur clumps in areas where it is thicker or where it is constantly compressed by movement. Take time to see how the clumps overlap, shadow each other, and weave in and out, which will improve the precision of your piece. Brush in the darker shades of color with your paintbrush, paying careful attention to the shading around the facial features. Ensure that the brush marks you use flow in the direction of the wolf’s fur for an effective quality, as the darker brushstrokes help define the texture of the fur. Wolves generally are gray and white, but if you study your photo or image you will see a spectrum of colors. Do not be afraid to paint these in. Note in your reference the direction of light, which gives objects pale and dark tones. Concentrate closely on the parts of the wolf’s body that the light hits, using a small paintbrush to smoothly dab pure white paint onto the fur tips over that part. Do the same with the parts that are shadowed, but with a dark brown or purple. Delicately brush in any reflections of light in the eyes and the stroke in the wolf’s whiskers. Keep referring to the original image or photo as you work through each stage of completing your painting to maximize accuracy. Clean your brush thoroughly between colors or to avoid unintended color-mixing.